Your newborn’s skin is extremely sensitive, which is why, no matter how careful you are, there are chances that your little one may get a diaper rash at some point. Wetness: Even if you are using a super absorbent diaper, there are chances that it may leave some dampness or wetness around the diaper area. This is one of the major causes of diaper rashes. Chafing or chemical sensitivity: Your baby’s diaper rash could be the result of his skin rubbing against the diaper. Avoid tight-fitting diapers and clothes that rub against the body. New foods: As babies begin solid foods, the content of their stool also changes. The changes in food can also change the frequency of the stools. If you are, however, still breastfeeding, the baby could develop a rash based on what you maybe consuming. Antibiotics: Introduction of antibiotics to your baby could also lead to a diaper rash. It also increases the risk of diarrhea and yeast infection. That’s because when a baby takes antibiotics, the bacteria that keeps the yeast growth in check gets depleted, resulting in diaper rash due to yeast infection. Sensitive skin: Babies with sensitive skin are prone to diaper rashes. In addition, if they suffer from eczema or atopic dermatitis, they are more likely to develop a rash. If you spot redness around your baby’s diaper area, chances are that it is a diaper rash. You may also be able to notice puffiness and the skin in that area maybe warm. However, if you are not sure, here’s what you should look for to identify a diaper rash. What does a diaper rash look like? While rushing to the doctor is advisable, you can also try various home remedies that are known to treat diaper rashes. However, please consult your doctor if you’re using any of these remedies for the first time or if your baby is less than 6 months. There are many natural home remedies that can comfort your child and speed up the healing process. You can find these products at home and they are all easy to use. Vinegar: Stale urine is high in pH (extremely alkaline) and can burn your baby’s bottom like acid. So in order to balance the pH-level, you can use vinegar. If you are using reusable or cloth diapers, then rinse them in vinegar solution (half cup vinegar to half-bucket of water). If you are using disposable diapers, clean the baby’s diaper area with a weak solution of vinegar and water and wipe clean. This will prevent yeast infection. Coconut oil: Use of coconut oil will prevent your baby from developing fungal or microbial infections. It also has a soothing and healing effect on your baby’s skin. You can apply coconut oil several times to the diaper area. You can also add a few drops of oil into the bath water to add moisturisation to the baby’s skin and also to prevent yeast infection. Petroleum jelly: Most doctors would recommend you to keep your baby’s diaper area clean, dry and moisturised. And petroleum jelly does exactly that. It also protects the baby from the irritation of urine and stool. Once you have cleaned the baby with warm water and a dry cloth, apply some petroleum jelly on the diaper area. Repeat the process every time you clean the baby. Cornstarch: It absorbs moisture and reduces friction and makes for a good treatment for diaper rash. Simply remove the soiled diaper and wash and dry the baby’s bottom with warm water. Apply some cornstarch once the bottom is dry and left to soak in air for a few minutes. Repeat the process every time you change the diaper. 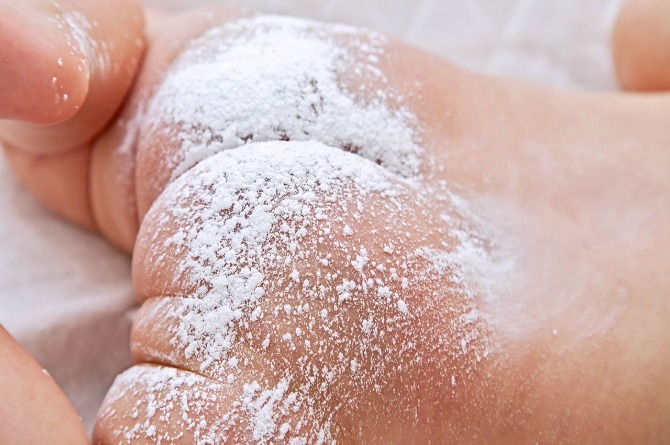 Baking soda: It has healing properties that makes it a good treatment for diaper rash. Add two tablespoon of baking soda to four cups of water and clean the baby’s bottom with this mixture. You can also bathe the baby in a mixture of baking soda and water before drying it and putting on a new diaper. You can try any of these home-remedies, all of which work quite well for newborns. However, the best way to prevent a diaper rash is to keep the baby clean and dry and let the diaper area breathe for a few minutes before you put on a new one.